One of the latest developments of Coperion GmbH, Stuttgart/Germany, to make its debut at Interpack 2014 is a blow-through valve type ZXD in Hygienic PLUS execution to be certified in compliance with the criteria of the European Hygienic Engineering & Design Group (EHEDG), type ED. With the new blow-through valves type ZXD and the discharge valves type ZRD Coperion GmbH now offers the food industry the first rotary valves in the world in Hygienic PLUS execution. A ZXD 200 will be shown on the Coperion booth no. 4D57 in hall 4. The EHEDG, type ED criteria formulate the requirements to be met by components that are used in systems with dry operation and dry cleaning processes. Important features of the certified Hygienic PLUS rotary valves are that they are easy to dismantle and that the component areas can be easily accessed for cleaning and inspection. The surfaces are smooth and the interfaces to the areas in contact with the product are step-free. Coperion was already a pioneer years ago in the development of CIP-compliant (Cleaning in Place), certified rotary valves and diverter valves that are cleaned with liquids. With the new EHEDG type ED-certified rotary valves the company now also supplies dry cleaning components to assist system integrators and end users who must reliably satisfy high requirements when it comes to sanitary design and operational safety in the food industry during the production, processing and transport of powders and pellets. The ZRD and ZXD Hygienic PLUS rotary valves are used in pneumatic conveying systems and for the discharge of powdered and pelletized materials. Also on display at Coperion's booth is a complete batch weighing system which will feature a Coperion K-Tron P100 Batch Weigh Receiver combined with a Coperion K-Tron KT20 loss-in-weight twin screw feeder, all in food grade finish. 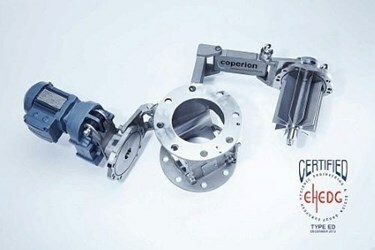 Coperion K-Tron receivers and feeders are ideal for handling a wide variety of bulk materials in the pharmaceutical, chemical, food and pet food industries. The P100 Batch Weigh Receiver combines a vacuum receiver with a reliable weighing system. The resulting combination allows multiple ingredients to be conveyed and weighed so that accurate batching of ingredients can take place on either a cumulative or sequential basis. As a Multi Material Batch Weigher the unit accumulates an exact amount by weight of several ingredients (generally max. eight) to form a batch prior to loading a mixer. As a Totalizing Weigher the unit continuously monitors the throughput of a single material in a process or accurately fills a bulk container. Coperion offers intelligent packaging machines with automated features that ensure crystalline, granular, beaded or flaked goods to be accurately weighed, ideally dosed and hygienically packaged. With self-cleaning functions and easy maintenance integrated into every solution, operators can rest assured that the processing lines will run smoothly. The company's packaging solutions include several models of Integrated Bagging and Palletizing machines, FFS machines and palletizers on motorized karts that can be easily adapted to existing plant layouts. These karts are able to move on rails or with independent wheel drive to allow X and Y movements without appreciable turn radius. All Coperion bagging and palletizing systems can be integrated into existing plant data acquisition systems for quality control and packaging efficiency control. The modular design allows an easy upgrade of machine performance to be made without the need to replace the complete system. A new cleaning system allows reliable cleaning to take place in less than a minute, without the need for operator attendance. This reduces the risk of product cross contaminations with a significant increase in the overall line efficiency. With the latest series of bagging and palletizing machines Coperion now offers plastics compounders reliable and innovative solutions to meet the challenging demands of automatic packing systems, especially when frequent product changeovers are required.